This would be great but it shouldn't be buried in the LP general settings like it is now. It should be underneath the site settings. It should also apply to the security challenge so it doesn't count as duplicate passwords. dwatkins714 Wrote: This would be great but it shouldn't be buried in the LP general settings like it is now. It should be underneath the site settings. It should also apply to the security challenge so it doesn't count as duplicate passwords. +1 vote for this feature. Thank you. Sometimes I wonder if anybody in the LP dev team even reads these suggestions and acts on them in direction suggested/requested by users. I have a hunch that ain't happening, except once in a blue moon. They say they looked at it 2-3 years ago, and the developers said "Great! Um, it's really hard to do though." and apparently, nobody in LastPass management had the stones to ... you know, manage people, ... and say "Um, you _are_ developers, right?" and "What part of 'as directed by management' don't you understand?" From that, we can expect nothing more than LastPass "fixing" or adding "easy to develop" features. Sad, that their standards are so high. But if implementing easy features is the best they can do, well, the hard choice of staying with LastPass or not is up to you. It must be awesome to work there, to be faced with nothing challenging ever to think about, do, or deliver to your customers or management. 11% (475 votes): Support for your other Windows application passwords. 07% (303 votes): Disposable Email Addresses. 05% (229 votes): Wildcard/Regex support for URL matching. 04% (183 votes): Autologout of websites (reverse of Autologin). 03% (110 votes): Versioning/Rollback support. 02% ( 82 votes): Safari support. 02% ( 73 votes): Windows Mobile support. 02% ( 68 votes): Opera support. 02% ( 66 votes): Blackberry support. 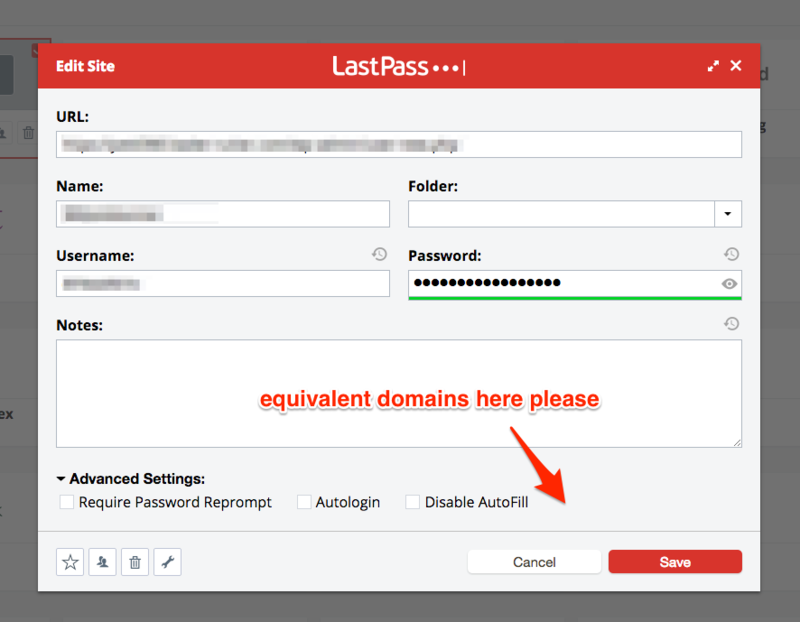 I lost patience, again, with lastpass. Me and lastpass are just not compatible - I can't stand this PoS and the unresponsive team. I went back to 1password and solved along the way, rather elegantly, the problem of synchronizing the passwords with spouse. My wife, uses lastpass and she's content with it. I use 1password (as of two days ago, again), and the way to synchronize with her lastpass is to keep both lastpass and 1password extensions in the browser but disable any message/autofill/option from lastpass except the detection of new passwords or the update of the existing passwords. When I change a password I get prompted by both 1password and lastpass, make them to ingurgitate the new pass and move along. I get the 1password password, she gets the lastpass password - problem solved, moving along with life. I worked under this mode for two days and seems to do the job. The reason I went back to 1password is because I have the possibility to introduce multiple different URLs under the same login, WITHOUT the stupid hassle of making domains equivalent. It just works, plain and simple. Additionally the on-demand fill of the fields is far more precise. Sean	I can sympathize with your frustration, the issue has been reported and it is a feature that we do see requested often. It has been moved and prioritized to our team in Budapest for inclusion in a future release. - What feature exactly is going to be included in the future release? - When is that future release? - Why is it not included in an earlier release? - How will it work exactly? - How is it going to overlap with equivalent domains? - Why exactly isn't a lastpass team member monitoring/replying to the "Feature Requests" threads at all?